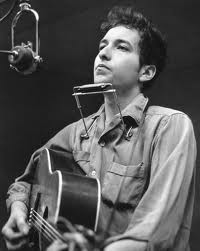 Bob Dylan was born Robert Zimmerman in Duluth, Minnesota USA in 1941. His grandparents were Jewish immigrants from Eastern Europe. During the 1960s, there was a lot of civil unrest in the US. Black Americans were fighting for equal rights with White Americans amidst appalling treatment and segregation, while students, intellectuals and pacifists were objecting to the war in Vietnam. 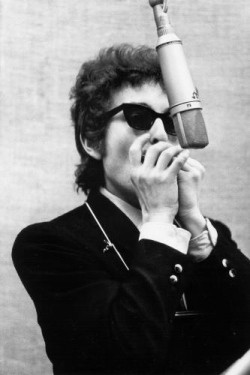 Songs by Bob Dylan, such as Blowing in the Wind and The Times They Are A-Changin’ became anthems for the civil rights and anti-war protesters. Initially his music was acoustic (unplugged) and when he relaesed his first ‘electric’ single in 1965, it caused quite a stir amongst his fans. His musical influences started with the country music of Hank Williams, before he fell in love with the Blues Music of artists such as Muddy Waters, Little Walter and Jimmy Reed. Then one day he saw a blues player called Jesse Fuller playing guitar, blowing rack harmonica and playing cymbals and drums with his feet. It was the sound of the rack harmonica that instantly caught his attention. Since then, whether acoustic or electric, many of his songs are punctuated by his trademark harmonica. It’s not sophisticated, but it’s certainly unmistakable. What makes it different is that, unlike the more famous blue players who specialised in the cross harp style, anchoring down those deep draw bends, he chose to keep blowing it straight.